The 32 Observations series continues, with Mark Chichester finding an interesting piece of information about all 32 teams after four weeks of football. If you would like to make some observations of your own, you can do so with PFF Elite, where you can find several signature statistics for every offensive and defensive position in football, thanks to Premium Stats 2.0. Buffalo Bills: Through four weeks, Kelvin Benjamin has generated a passer rating of just 27.5. That’s the lowest mark among receivers this year and the eighth-lowest mark we’ve ever seen from a wide receiver with at least 20 targets in the first four games of a season. 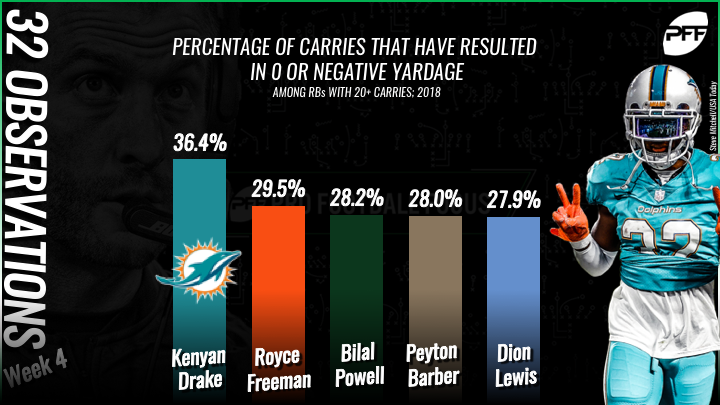 Miami Dolphins: Running back Kenyan Drake has been tackled for zero or negative yardage on 36.4% of his carries so far this year, which is by far the highest rate among running backs with at least 20 carries. New England Patriots: James White is the only running back in the league who has been tasked with at least 20 carries and not been stopped for zero or negative yardage on a single attempt. New York Jets: Rookie quarterback Sam Darnold has now thrown eight turnover-worthy passes in four games, which is the most among quarterbacks so far this year and tied for the sixth-most ever recorded by a rookie quarterback in the first quarter of a season. Baltimore Ravens: Ravens pass-catchers have combined to drop 12 passes so far this season, which is the most among the league’s offenses. Since 2016, Joe Flacco has suffered 70 total drops, which is the fifth-most among quarterbacks in that span. Cincinnati Bengals: Wide receiver Tyler Boyd has generated a WR rating of 140.4 on his red zone targets so far this year, which is second only to Calvin Ridley through four games. He’s caught all five of his red zone targets for 41 yards and a touchdown. Cleveland Browns: 15 guards this season have seen at least 175 snaps in pass protection so far in 2018. Of those 15, right guard Kevin Zeitler leads the group by having allowed just three pressures this season. Pittsburgh Steelers: Running back James Conner has forced 10 missed tackles as a receiver so far this year, which is tied with Alvin Kamara for the most among running backs. Houston Texans: Left tackle Martinas Rankin has given up 27 total pressures so far this year. Not only is that the most among tackles so far this year, but it’s the most ever given up by an offensive lineman in the first four games of a season. Indianapolis Colts: The Colts offensive line has allowed 15 quarterback hits so far this season, which is second to only the Cardinals. Jacksonville Jaguars: Jeremy Parnell is yet to allow a pressure on a dropback that took 3.0 seconds or longer. He’s one of only three offensive tackles to achieve this feat so far this season. Tennessee Titans: Cornerback Adoree’ Jackson has allowed a passer rating of just 9.0 when he’s been targeted on deep passes this season, which is the third-best mark among cornerbacks with at least five deep targets. Jackson has been targeted 24 times on deep passes during his career, and so far, he’s allowed just three receptions. Denver Broncos: So far this year, Emmanuel Sanders is averaging 3.78 yards per route run on his pass patterns run outside of the numbers. This is the second-best mark among receivers with at least 30 routes run so far. Kansas City Chiefs: Through four games, Edge defender Dee Ford has produced five total pressures when defending inside the red zone – the most by an edge defender so far this season. Los Angeles Chargers: Melvin Gordon has averaged 2.39 yards after contact per attempt when he’s been hit at or behind the line of scrimmage. This is the best mark among running backs with at least 15 attempts. Oakland Raiders: Second-year cornerback Gareon Conley has allowed a passer rating of just 25.1 when he’s lined up in press coverage this year – the second-best mark among cornerbacks with at least 10 targets. He’s allowed just five receptions from 15 targets for 83 yards and an interception. 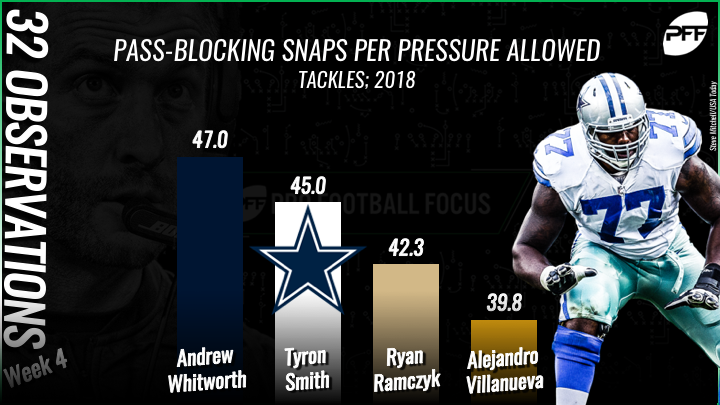 Dallas Cowboys: On average, veteran offensive tackle Tyron Smith is allowing a pressure once every 45 pass-blocks. This is second to only Andrew Whitworth so far this season. New York Giants: Eli Manning has checked down on 11.9% of his pass attempts this season, which is third-highest rate among quarterbacks with at least 70 attempts this season. He trails Blake Bortles (13.3%) and Alex Smith (12.5%). Philadelphia Eagles: The Eagles have targeted their tight ends in the passing game 68 times so far this year, which is the most ever recorded by a team in the first quarter of a season. Washington Redskins: Pernell McPhee has only played 27 pass-rushing snaps in his three games this year, but he’s produced pressure on 29.6% of those pass-rushing snaps, which is the best rate among edge defenders so far this year. 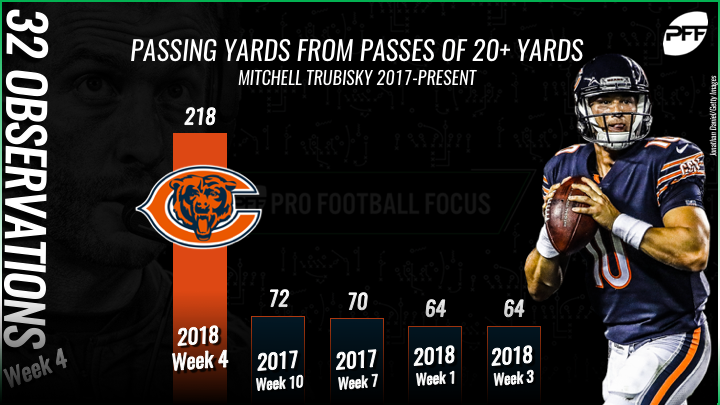 Chicago Bears: In his Week 4 game against the Bucs, quarterback Mitchell Trubisky attempted eight deep passes (passes of 20 or more yards downfield) and completed seven of those passes for 218 yards and four ‘big-time throws’ – all of which are career-best marks for the second-year quarterback. Detroit Lions: The Lions defense has contested 20.0% of the passes they’ve faced in 2018, which is the highest rate among teams so far. Green Bay Packers: Through four games, Aaron Rodgers has thrown the ball away 11 times on his 53 dropbacks under defensive pressure. His throwaway percentage of 29.6% on pressured dropbacks currently leads the league’s quarterbacks. Minnesota Vikings: Through four games, no receiver in the league has logged more receptions as the result of being ‘open’ as Adam Thielen, who has 28 so far this year – eight more than the next closest receiver. Atlanta Falcons: Quarterback Matt Ryan has accumulated 447 passing yards from deep passes so far this year, which is the fourth-most ever recorded by a quarterback in the first four weeks of a season. Carolina Panthers: Christian McCaffrey is averaging 3.09 yards before contact every time he runs the ball this year. This is second only to Matt Breida through the first four weeks. New Orleans Saints: The Saints offensive line has allowed pressure on just 20.6% of their pass-blocking snaps so far this season, the third-best mark among teams. Tampa Bay Buccaneers: Running back Peyton Barber has been hit at or behind the line of scrimmage on 64.0% of his carries this season, which is by far the highest rate among running backs with at least 20 carries. Arizona Cardinals: Quarterback Josh Rosen ended his first Cardinals start with a passing grade of 89.9, which is the highest mark by a Cardinals quarterback since Carson Palmer posted a passing grade of 91.4 in Week Week 15 of the 2015 season. Rosen ended the game with five big-time throws next to his name, which is more than both Josh Allen (3) and Sam Darnold (3) have managed in four games this season. Los Angeles Rams: Aaron Donald recorded 13 total quarterback pressures in his Week 4 game against the Vikings, which is tied with J.J. Watt for the third-most pressures ever recorded in a single game by an interior defensive lineman. 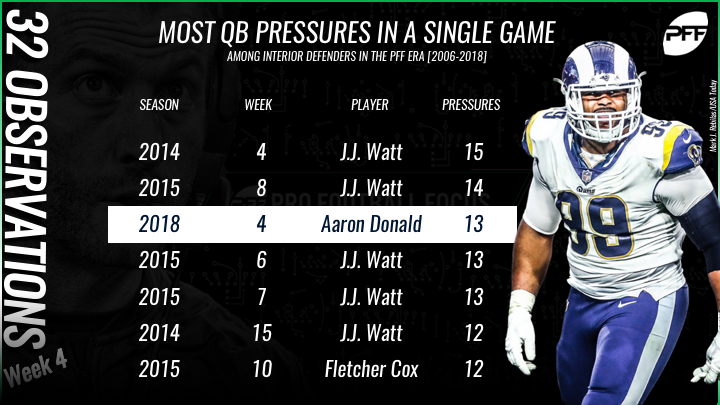 Since PFF started grading games back in 2006, Donald and Watt are the only two interior defensive linemen to surpass 12 quarterback pressures in a single game. Donald has done it once, Watt has done it four times. San Francisco 49ers: Tight end George Kittle is averaging 11.6 yards after the catch per reception this season, which is the best mark among tight ends with at least 25 targets this year. Seattle Seahawks: Cornerback Justin Coleman has allowed just 0.48 yards per coverage snap so far this season, which is the fifth-best mark among cornerbacks with at least 10 targets.